Have you registered for the Location Innovation Awards? It’s not too late. The Location Innovati0n Awards don’t close until February 16. Recently I came across a site that shows potential, but they are not yet using GPS or mobile. Nevertheless, their concept is very good. In simple terms Woices allows you to record comments on the net about places that you have been to, called ‘Echoes’. Using reverse geocoding you can tag the location to a map so that people can go to a map and see the locations that have ‘Echoes’ and then listen to them. From a Location Innovation Awards perspective, this would be a great concept to make mobile. Whether it’s through GPS or triangulation, it would be a simple thing to create an application that takes advantage of the mobile knowing it’s position, recording a voice message and a photo and then uplocaing it to a website. The concept of a social community sharing information is becoming commonplace, but most of these applications are web based. This is fine when you are planning a trip, but could be much better if it was made more mobile. When I travel overseas and am looking for accomodation or activities, I check them out on Travelocity. The reason I do this is because the public can upload comments. Last year I had a short holiday in jamaica and found this system very helpful. For example the first resort I looked up in Montego Bay looked great on the hotel’s website, but the comments said things like, “If you are single and want to party 24 hours a day, this place was made for you. Don’t bring your kids. ” Using people’s comments I found the perfect resort and it was exactly what the comments said it would be and I was very happy with my selection. Mobility means you can do much more. For example let’s say you are in Rotorua and looking for somewhere to have a brunch. Using your mobile you could search for cafe’s or restaurants within a kilometer of where you are and listen to the ‘Echoes’ other people had left. For example “great food but it took an hour to get it to the table’. From a tourism perspective, sharing information that you can access from your phone could be great. I was talking to someone recently who went on a motorhome tour of New Zealand and they told me that some of the best places they stopped for the night weren’t marked on any maps, they found out about them from other motorhomers who told them where to find spots where they could park by the water and enjoy wonderful sunsets. A GPS mobile application could allow you to locate all sorts of interesting places based on the recommendations of others. Voice messages like this can be in multiple languages and would allow you to enjoy high tech results without requiring you to have computing skills or sophisticated technology. In addition to info from fellow travellers, this is also a great opportunity for locals to share information with travellers about local history, amenities and attractions and people have already started doing this on Woices. A concept like this in a mobile environment would fit into several categories of the Location Innovation Awards, including the best Tourism Application and the AA Maps Widgets which could earn you a luxury adventure in a Maui Camper. Are you deciding where to go on your summer holiday around New Zealand, or perhaps looking for a weekend adventure? Before you head out on your Kiwi Road Trip, have a look at what GeoSmart has added to the AA Maps web site. There are many new and improved features. You can now create your complete itinerary and then change the order of the stops and even check the real time traffic conditions before you leave! Let’s say you were going to take the kids to Rotorua. You had decided on the Luge, the Agrodome for a ride in the Zoorb, a jetboat ride and the other cool activities they have there, and Rainbow Springs to feed the trout. You set your itinerary on AA Maps and then decided to change the order so that you could finish the day with a meal at the top of the gondola ride and enjoy the views with a nice sunset. Now you can drag and drop the destinations, automatically generating new driving directions from A to B to C to take with you in the car, even showing the travel distance and driving time from one to the next. You can find your accomodation from AA Maps and when you select it you can look for other amenities such as restaurants within 5km of the property. In this instance my search found 10 within 400 metres of the Millenium Hotel. You can now set up a free account on the page and store your ‘Favourites’ so that you can find them again later and you can even leave a ‘rating’ once you have been there so that other people can appreciate the great experiences you enjoyed. Many Kiwi’s feel they know their way around New Zealand and don’t need mapping websites. All good and well, but they don’t know there was a major accident which has blocked the Auckland Harbour Bridge or a slip which has closed the Milford Sound Rd. Now we have included AA Real Time Traffic as well as Traffic Web Cams. There are certain holiday spots that often have traffic jams at peak times such as Long Weekends or the start and end of major holiday periods. In winter there may be ice and snow, or slips that can close lanes or sometimes entire roads. 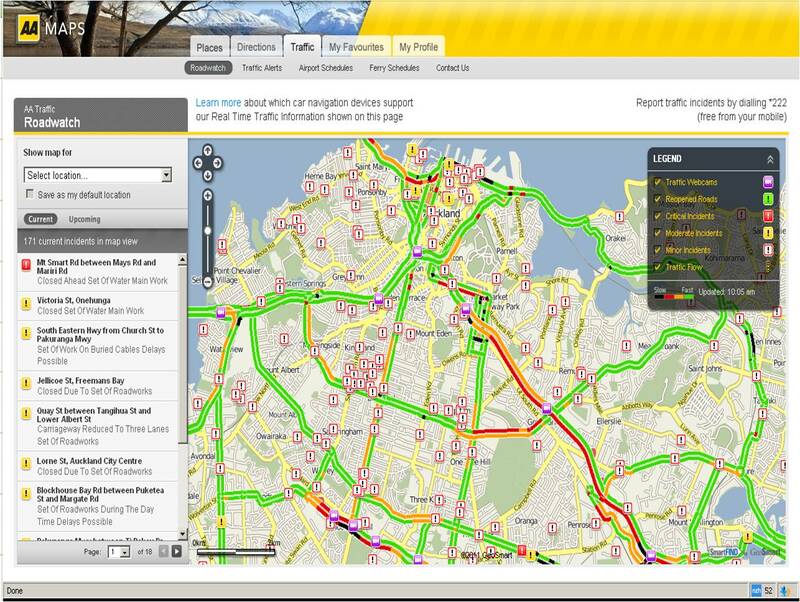 Yu will be able to find this information on the AA Maps web site, where you can select from Minor Accidents, Major Accidents and Traffic Webcams where you can see the traffic flows, refreshed every minute. If you live and drive in New Zealand, you are probably a member of the NZAA which has many great services to offer you. As a member, these are your services and another important feature is the Feedback button which allows you to tell us whatever you want to, whether it is suggestions for new features, a Point of Interest we didn’t know about, perhaps a restaurant that has changed ownership and has a new name. This is a never ending project as new technology continues to allow us to add new services and features. If you would like a map on your own website, AA Maps will give you an idea of some of the features GeoSmart can offer you, but wait, there’s more. Many of the services we offer are not relevant to the AA Maps website. Of course there is also the AA Maps Bizlocator, which not only gives you a free map and directions from your company web page, but also lists it with car navigation brands so people in their cars can find their way to you. . We have lots of other services, so if it’s to do with location and you have a need, please feel free to ask us any time. For more information about GeoSmart, please go to our Home Page. For AA Maps, click here. This blog is offered as an interactive comunication, so please feel free to comment or make suggestions here as well. We welcome your feedback. 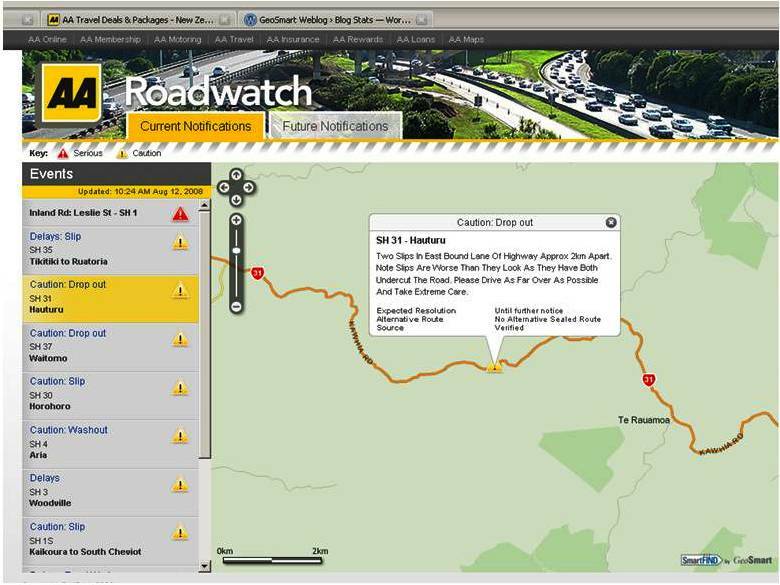 GeoSmart Maps has rebuilt the NZ Automobile Association’s Roadwatch web site and re-launched it to inform motorists about events taking place on New Zealand roads; this includes road works, accidents, road closures, delays and incidents such as slips and washouts, which are very topical given current weather conditions. The original web site had generic maps which showed the general area where incidents had occurred, whereas the new site has dynamic maps allowing people to view the incident location on a map at region, suburb or zoom right down to street level. A pop up window on the map provides in depth information about the incident including its anticipated resolution date and time. The site dynamically updates information every 5 minutes and indicates whether the incident has been verified. The service also includes Future Notifications such as events and other known issues. “The service will be fully managed by the AA and a call centre which is operational 24/7 will feed public information into the system. The system will also soon have the ability for local authorities to enter information about planned road works,” says GeoSmart’s General Manager Phil Allen.